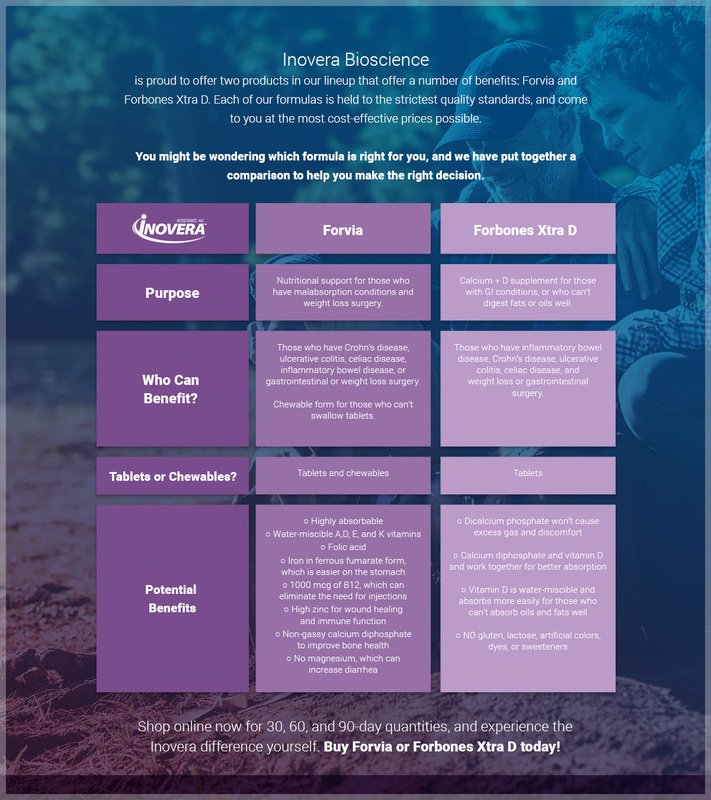 Thank you for your interest in Inovera Bioscience, and our two high-quality multivitamin supplements, Forvia and Forbones Xtra D. You might be wondering which product will work best for your health and dietary needs, and we have put together an infographic to help in your decision. Always speak with your healthcare provider before choosing a nutrient supplement to ensure our products are right for you. 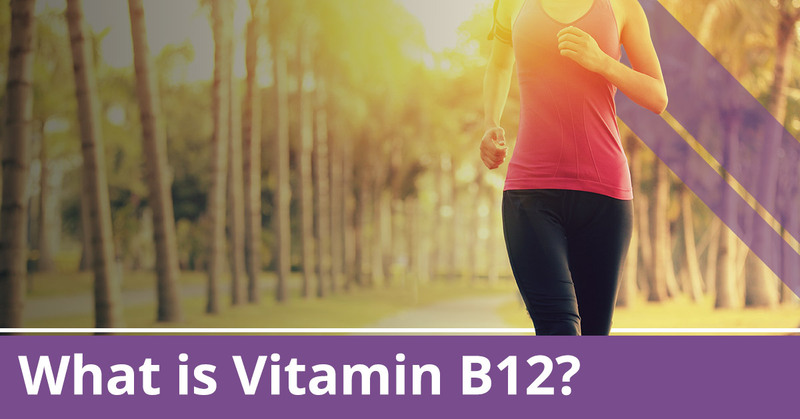 At Inovera Bioscience, we have put our resources into creating an adult vitamin formula that adheres to the strictest criteria that meets all applicable FDA standards. We use only the highest quality ingredients in our mineral vitamins, and manufacture and package our products in USA facilities. All of our nutrient supplements we produce are laboratory tested, and we take measures to ensure potency and stability. We have formulated our multivitamins and supplements to be highly absorbable so that people who suffer from malabsorption conditions can take them and receive the nutrients they need. Whether you have Crohn’s disease, celiac disease, ulcerative colitis, or have had gastrointestinal or bariatric surgery, our mineral vitamin formula is designed for you. Forvia is a highly absorbable multivitamin supplement formulated for those have a decreased ability to absorb vitamins and minerals from their diet. We’ve included key vitamins and minerals that can decrease stomach upset and gas while being very effective. 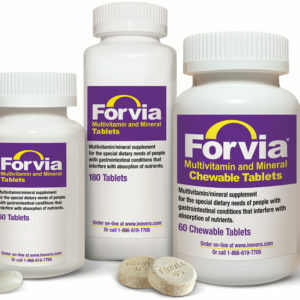 Forvia comes in a tablet or adult chewable vitamin form. Forbones Xtra D is a calcium plus vitamin D supplement that is gentler on the stomach than other calcium supplements, and it is formulated to be less gassy. Additionally, our vitamin D and calcium supplement is formulated to be highly absorbable, and includes dicalcium phosphate, calcium diphosphate, which provides the two largest components of bone, calcium, and phosphate, plus vitamin D — all of which work together to aid in absorption and utilization of calcium. 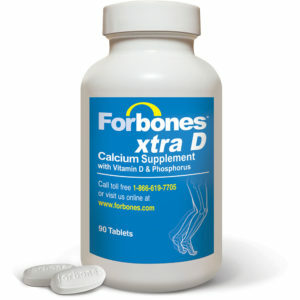 Forbones Xtra D comes in tablet form. To buy Forvia and Forbones, click on the links below!